On Dragon1 we provide you with a Task Manager. 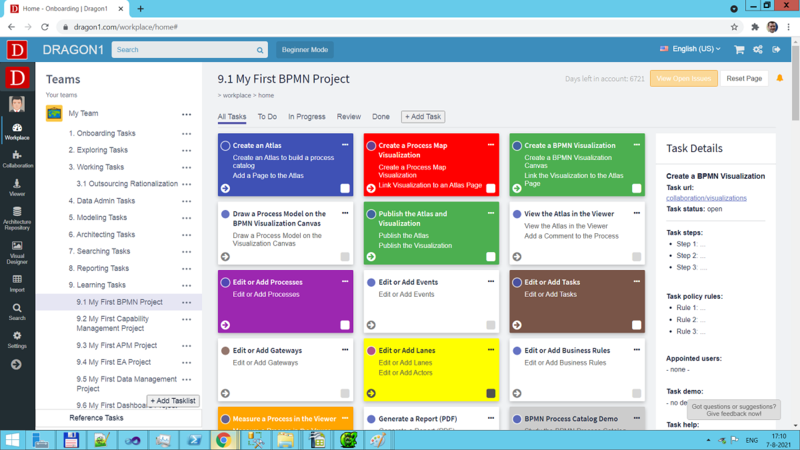 With the Task Manager you can plan tasks for yourself or for others. You can use the task management as an innovative means for transfering knowledge. Before you can use the task manager, you first need to go to the login screen via the startup screen and then login. Next via the startup screen you can startup the task manager. 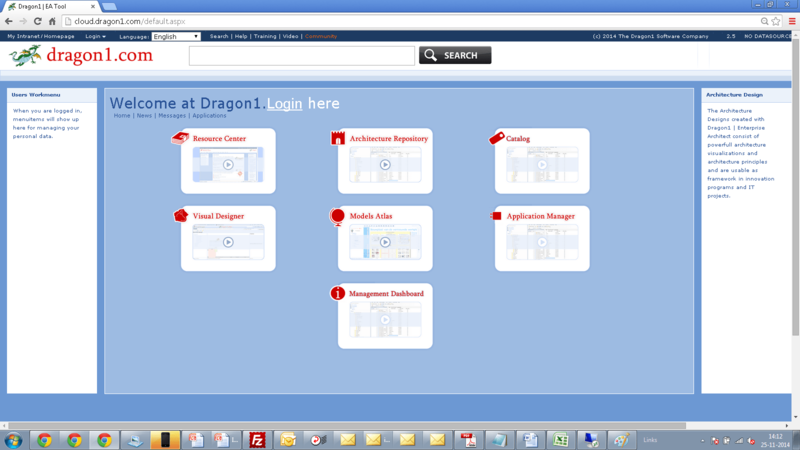 When you click on the Dragon1 Logo the 'digital workplace is shown with the task list for current outstanding tasks. As you see, tasks that run over the deadline will change color. In the Digital Workplace you can also check your messages, chats, news and calender and plan your events and see the availability of your colleagues or team members. You also have quick access to the tools you often use. 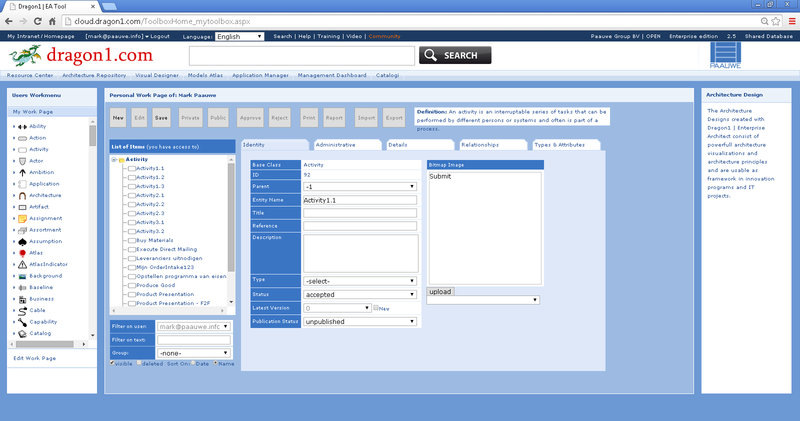 On the left side of the screen you can choose from 250+ generic content types to enter and manage data for. Recent changes to these content types from you or team members are report on the My Work Page. On the Home web application (click on Home in the Start Up screen), you will see what tasks are open for you, what is on your calender and what the latest news and next events are. In the sidebar of the startup screen you can access quickly one of the 150+ default Entity Classes Cardboxes for creating and managing a list of data. Via the My Work link on the left you can get an overview page, like above, of the work that is planned for you to do and what you have done. You can also view the work page of team members. 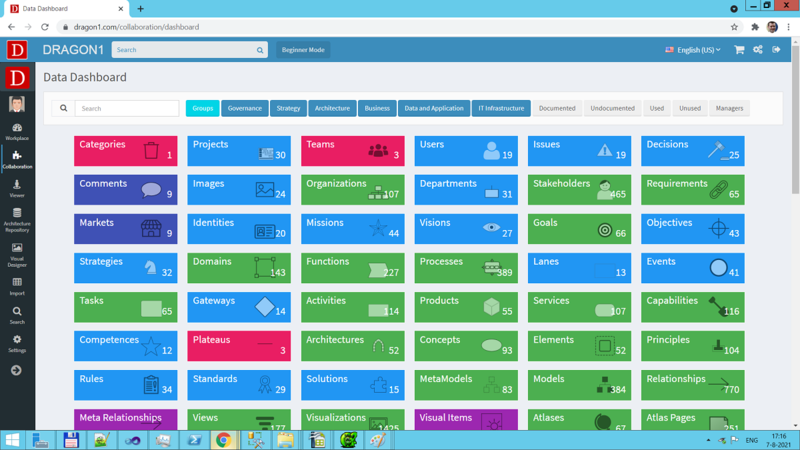 This enables collaboration very much in creating architecture products together. Go to "www.dragon1.com", see the Dragon1 - Main Screen and click on Login. You are now in a safe (https/ssl) environment where you can click on a module to enter, based on your credentials. Interested to work with the Task Manager on Dragon1?